Yes, those are words that came straight from my mother’s mouth one day while we were talking on the phone. I beamed as she said that to me because she was raised on a farm, but I wasn’t. So for her to be proud that I am raising my boys on one makes me happy. But raising kids on the farm isn’t easy, it isn’t all fairy tales, and this day in age, it doesn’t come without your kids pushing back sometimes. Truthfully, my kids aren’t always happy to rise and shine to go feed the chickens. They don’t always enjoy the massive amounts of canning they help me with each summer. Yet, I know it is good for them to learn these skills. It is good for them to know how to survive because you just never know when they might need this. Which is why all of my boys have chores. 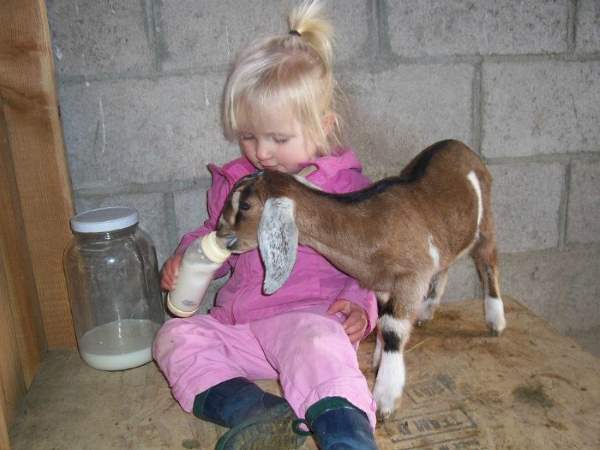 They all have hands-on experience as to what we do around our homestead. That way they are learning and helping. 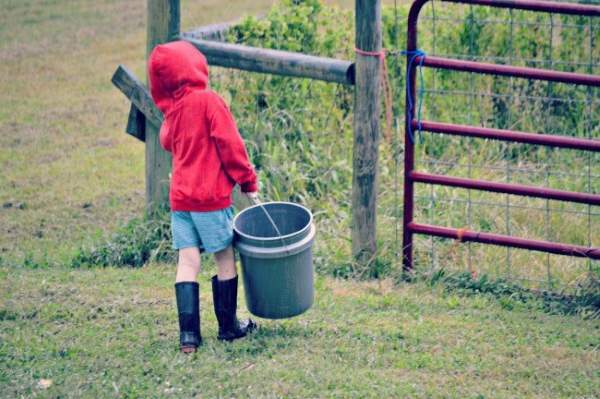 So here is a list of chores, by age, that most kids should be able to do around the farm. Your kids may be able to handle more, or maybe they aren’t ready for some of these chores at the specified age. That’s okay. Kids are all different so just use your judgment as to what you think your kids can handle. At this age, kids are learning a lot. They are becoming mobile, talking, and grasping so many other skills. Which is why it is important to let them follow you around and do little things with lots of supervision. The world is new to them, and they are ready to explore! This is the age where kids are going to want to start branching out on their own a little and see what they can actually do. It is important to make sure that you don’t expect perfection right out of the gate because it is probably not going to happen. Also, you’ll want to make sure that you show your children multiple times how to do something properly. Then supervise for a while before leaving them on their own to do it. That way you can be right there if they have any questions. But once you see that they have it down, cut them loose and let them have a go at it. You’ll be so glad to have the extra help. I have very fond memories of my youngest helping to move wood around our property when he was this age. Nothing is cuter than little boy running around in a hat that looks like a moose. It had moose antlers that stuck out on the side of his head, and he had the matching moose gloves. But he didn’t care how cute he was. He hauled wood just like the rest of us and was so proud when the job was completed. This age range is when kids begin to start gaining some serious independence. They want to prove that they can keep up and do as good a job as the older kids are. I’ve always enjoyed when my kids were in this age range because they are so curious. Kids at this age can…. As I said before, I really love this age because of the curiosity. I shared here that we are actually a homeschool family. This age range is always where our fun projects really start to blossom. So every year, my child in this age range grows a small garden of their own to learn that skill. It was always a lot of fun and showed them how much work a garden actually takes. I have one child in this age range right now. He is starting to turn into a young man who wants to do a good job and make us proud. On the other hand, he wants to hurry up and get things done so he can go back to what he wants to do. Which doesn’t always produce quality work. 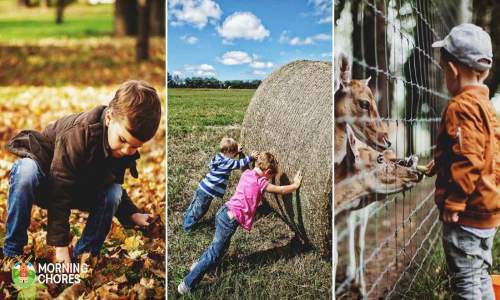 So since the chores get to be a little more important at this age range and a lot more independent, I find it important to make sure that my kids have thorough training at this level, lots of supervision, and they must have an understanding that what they do really does depend on the success of our homestead. Now, I’ll be honest, I wish that explaining this always made a huge difference in the work ethic, but it doesn’t always have that effect. However, as your child grows, matures, and sometimes learns a few hard lessons on how much their job actually matters it should hopefully encourage them to give it 110%, just like mom and dad do. Help to keep the homestead organized by organizing tools, buildings, etc. As you can tell, at this age, these chores can often times be the difference in an animal living or not. It can also be the difference in animals being properly cared for or necessary tools around the homestead being lost. So these jobs do matter. I was able to really bring this home for our middle son when I allowed him to pick out chicks to raise as his own. It was also a school project. He took ownership when he felt like they were his birds. It was a fun experience and one that really birthed maturity on his part to where he could wrap his head around how important his chores actually were to our family and our homestead. This age is great! My oldest is 18 now, but he is such a help to us around our homestead. We homeschooled him all the way through high school, and it was so great. He learned a lot about farming, he got a lot of quality time with his parents through that shared experience, and he was just such a help! Now that he’s in college and working too, he isn’t around as much as he once was. We not only miss spending time with him, but we realize just how much of a help he was to us with keeping our homestead rolling. So if you have a child this age, if you show them how to do their chores, they should be able to grasp the importance and hopefully be as much of a help to you as our son was to us. This may sound like a lot, and I don’t want you to think that once you have a child this age that the homestead solely rests upon them because it doesn’t. The way I approached it is I am one person trying to run a homestead, raise kids, keep a house, and work. So if there were days that my plate was just running over, I’d give some of my homestead tasks to my oldest so my day would be manageable again. Not to mention, I also approached it with the thought process of, he isn’t going to be home forever, and I’m not going to be around forever. He needs to learn how to do basic life skills such as basic farm duties and household duties because if I don’t teach him, who will? Well, now you have a suggested list of chores for your children, by age, to help around the homestead. It will give your children knowledge, which is so important, and it could also help instill a work ethic in them as well, which is important as well. So now I’d like to know, do your kids have chores around the homestead? What do they do? Can you tell a difference in them by allowing them to help and do things themselves around the homestead? 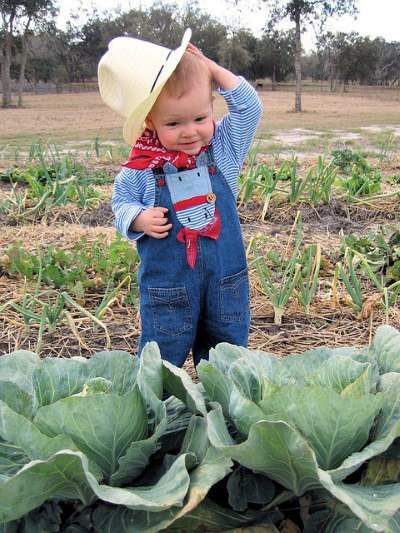 Any advice for people that may be new to having their children help with the homesteading? We’d love to hear from you so please leave us your thoughts in the space provided below. This article does a great job of breaking down age appropriate chores. It is important to instill responsibility and survival skills at a young age. The earlier that you start, the easier it is for your child to incorporate prepping into their daily lives all the way into adulthood. Thank you!